-Pound-to-Dollar, Euro-to-Dollar forecasts downgraded at Lloyds. -Pound-to-Euro rate forecast for year-end is upgraded by default. -US Dollar remains a key driver of currency markets and forecasts. Pound Sterling and Euro exchange rate forecasts were downgraded by Lloyds Bank, in its latest International Financial Outlook, this week following a month where the US Dollar has continued to reign supreme over all of its rivals. The US Dollar has benefited this year from superior levels of economic growth that have enabled the Federal Reserve to remain on the front foot and keep raising its interest rate. This, at a time when the interest rate outlook elsewhere in the world has deteriorated, has created an incentive for traders to sell other developed world currencies and buy Dollars. 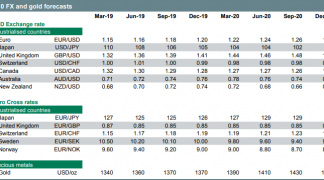 Lloyds Bank strategists say the Dollar has now topped out and that it, as measured by the US Dollar index, should decline gradually over the coming quarters. However, the greenback's retreat will be slower than previously thought, which means respite for other currencies will now come later. Accordingly, both Pound-to-Dollar and Euro-to-Dollar forecasts have been downgraded. Although, owing to an earlier reluctance on the part of the Lloyds team to adjust its Euro forecasts lower, the bank's Pound-to-Euro forecast has been upgraded by default in August. This is because the Euro-to-Dollar downgrade has been much steeper than that incurred by its Anglo rival this month. After all, the Pound-to-Euro is a foreign exchange cross rate that is calculated at its most basic level by dividing the Pound-Dollar rate over the Euro-to-Dollar rate. In order for the Sterling to rise against the Euro, the Pound must move further and faster against the Dollar than its continental counterpart does - or fall slower against the Dollar than its European counterpart. The Pound-to-Dollar rate was quoted 0.06% lower at 1.2870 Thursday while the Euro-to-Dollar rate was down 0.34% at 1.1570. The Pound-to-Euro rate was 0.29% higher at 1.1124. "Despite a rebound in the second quarter for UK economic growth and a ‘hawkish’ hike from the BoE, the pound has been firmly on the back foot against the US dollar, depreciating by almost 10% since the middle of April." "It is clear that attention has shifted to the downside risks around Brexit. The increasing risk of a ‘no deal’ – recently highlighted by comments from Trade Secretary Fox and BoE Governor Carney – have led to an increase in the ‘Brexit risk premium’, also translating into an uptick in implied volatility." "Our central case assumes the UK government will conclude a withdrawal agreement by March 2019. We believe that optimism around such an agreement should see GBP/USD rally as the risk of ‘no deal’ fades. In our central scenario, we forecast GBP/USD at 1.35 at end-2018 and 1.33 at end-2019." "With the pound and euro both softening against the US dollar, GBP/EUR remains confined to a narrow medium-term range. For now, we expect that range to hold." "The fundamentals suggest the currency pair should be a little higher...The respective interest rate differentials should be providing more support to GBP/EUR. Yet, the market is seemingly paying little attention to fundamentals, but is instead primarily focused on Brexit-related developments." "The outcome remains highly uncertain at this stage. In our baseline scenario, we forecast GBP/EUR at 1.14 at end-2018, falling to 1.08 at end-2019." "Having come under renewed pressure against the US dollar in recent weeks, the euro is hovering just above its summer range lows. The currency pair has not been helped by the disappointing economic performance across the Eurozone in the second quarter of 2018." "From a weather-depressed 0.4%q/q in Q1, Eurozone GDP growth, somewhat surprisingly, fell to 0.3%q/q in Q2. At its July meeting, the ECB provided only limited clarity over its forward guidance relating to interest rates." "In the US, GDP growth remains firm, the labour market tight, and inflation on an upward trajectory. These are consistent with Federal Reserve projections, which support its stance for ongoing policy normalisation." "Despite interest rate profiles that imply a further decline in EUR/USD, we believe the pair will rally from here. The key risks to the euro have subsided, with reduced political turbulence in Germany and Italy and trade tensions between the bloc and the US de-escalated for now. As such, we forecast EUR/USD at 1.18 for end-2018, rising to 1.23 at end-2019."